An international team, including scientists from our OSE team, has not only designed a reduced-format acoustic lens, but also developed models to design these structures and optical sensing method to validate these systems. 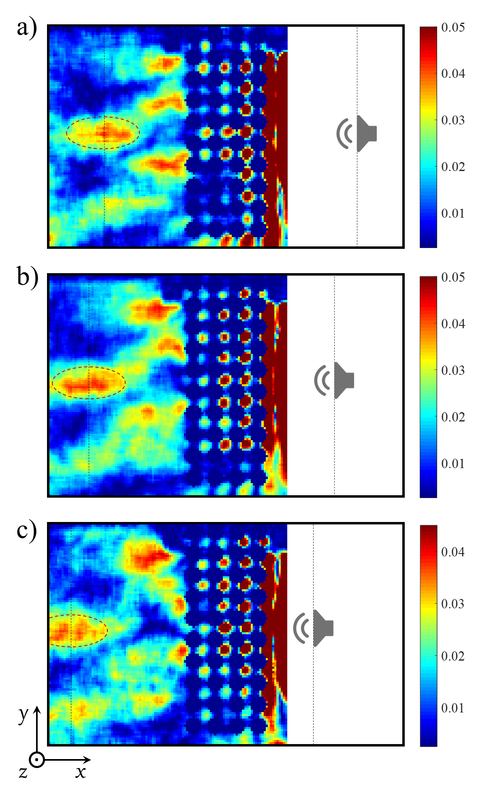 This work, published in Physical Review B, could help produce acoustic metamaterials that can deflect or muffle noise. To manipulate a wave, the size of the elements depends on its wavelength. Thus, a lens shaped for a high-energy laser may be tiny, while an acoustic wave may require an equivalent in meters. However, a group of researchers has developed systems to manufacture much smaller acoustic lenses. They reproduce the three-dimensional image of a sound source emitting at 10.6 kHz, thanks to a custom-made crystal about fifteen centimetres high and wide, for six in thickness. This lens was assembled from four hundred polymer resin spheres, realized by a 3D printer. The size of the spheres and their spacing were determined by simulations that simplified wave propagation, emulated here by a mass-spring system. The assembly behaves like a phononic crystal, with properties that do not exist in continuous media. By monitoring the pressure changes produced by acoustic waves, an interferometric sensor by optical reinjection into a laser diode makes it possible to verify that this phononic crystal behaves as a functional lens. This offers a new opportunity for the design of acoustic metamaterials, with applications to the design of MRI devices, for example, to make them quieter. This would soothe patients, who would then move less, improving imaging and allow a claustrophobic public or young children to be diagnosed without general anesthesia.